My edges haven’t been brilliant and none of my temples will fit this width, so I’m using a suggestion from a couple of weaving friends, of clips and weights. It seems to be helping as the width has recovered a little. 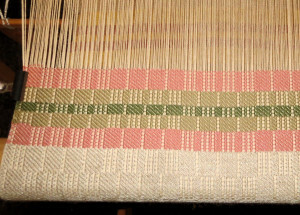 As an interesting aside, I wove off the last bit of the first warp with a very heavy coarse tow linen thread. 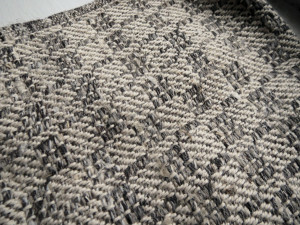 The fabric is very interesting and looks like it might make a good furnishing fabric, though I’ll need something a little less scratchy than the tow yarn! This entry was posted in Whats going on! and tagged handweaving, Teatowel, twill, weaving. Bookmark the permalink.